Diehl — 2.5 HP—440/3/60 — 1750 RPM — 3.53 amps. Single stage — 2l/2" suction — 2" discharge. 3000 RPM — 250 GPM. 100 lb. head. TOR: Air cooled heavy duty 25 HP Reliance T type ON- 2S-2i/2 230 VDC—110 amps —stab, shunt. n rriETRLS CO.
Base 6' x 6' 3y2". 16"
OF DOLLARS with these modern, practically new units — built to highest Navy stand- ards. Send for our free descriptive brochure. You'll be glad you did .... and money ahead! 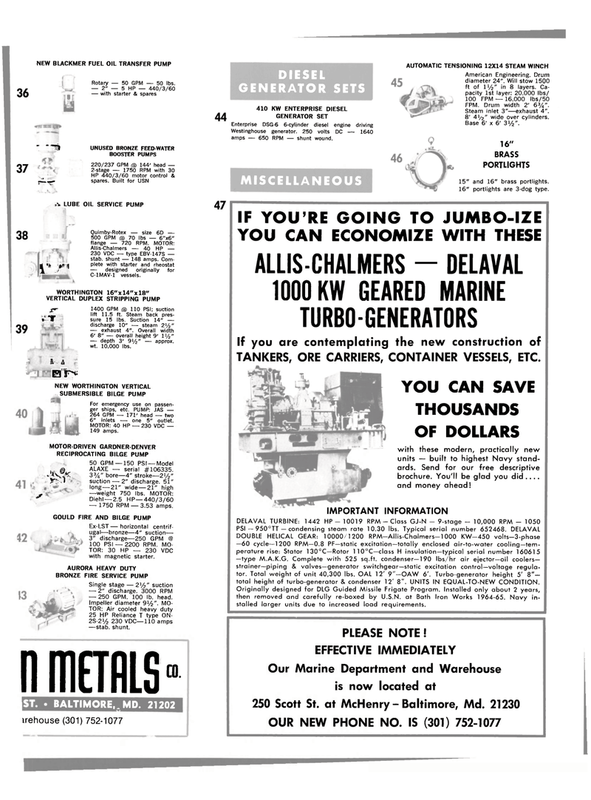 DOUBLE HELICAL GEAR: 10000 1200 RPM-Allis-Chalmers-1000 KW-450 volts-3-phase —60 cycle—1200 RPM—0.8 PF—static excitation—totally enclosed air-to-water cooling—tem- perature rise: Stator 130°C—Rotor 110°C—class H insulation—typical serial number 160615 —type M.A.K.G. Complete with 525 sq.ft. condenser—190 Ibs/hr air ejector—oil coolers- strainer—piping & valves—generator switchgear—static excitation control—voltage regula- tor. Total weight of unit 40,300 lbs. OAL 12' 9"-OAW 6'. Turbo-generator height 5' 8"- total height of turbo-generator & condenser 12' 8". UNITS IN EQUAL-TO-NEW CONDITION. RCA HP 440 Headphone/Headset oil coolers rriETRLS CO.